Let’s face it. World conditions are rapidly de teriorating, spiraling out of control. From a human perspective, the future of mankind has never been more uncertain. Meanwhile, were is God? Does God have a plan and purpose for mankind—for you personally? The answer is a resounding, Yes! But you won’t find God’s plan revealed among scientists, philosophers or the so-called scholars of this world. And organized religion offers little evidence of God’s direct involvement in the course of humanity. Hampered by politics, tradition and myth, even professing “Christianity” has failed to clearly articulate the Divine Purpose being worked out here below. Why? Because God has deliberately hidden this vital knowledge from the “wise” and “mighty” of this world. He has chosen instead to reveal His plan to His elect—those precious few who faithfully follow His Word. Carefully hidden in the pages of your Bible, God reveals that He does indeed have a plan—called the “Mystery of God”—through which He will save mankind from utter destruction. Now you too can understand the truth of God’s awesome plan! 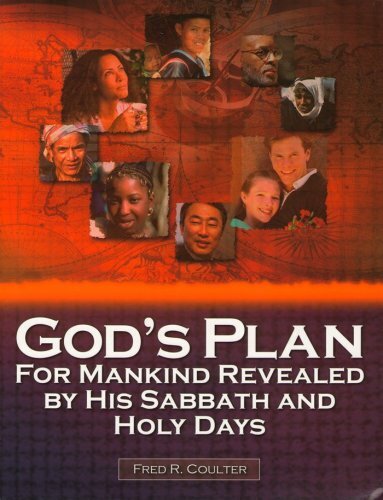 God’s Plan for Mankind Revealed by His Sabbath and Holy Days is the first-ever book to provide a comprehensive look at God’s amazing Master Plan for the human family—precisely as it is outlined by the biblical seventh-day Sabbath and annual holy days. Long cast off as “Jewish,” the Sabbath and yearly festivals actually picture in sequence the various stages of God’s plan. Indeed, they are the “lost” key to understanding where we are today—and exactly what tomorrow will bring! A full 574 pages, God’s Plan for Mankind reveals God’s purpose from the beginning to the end—from Genesis to Revelation. Each chapter is a transcript of an in-depth sermon or Bible study, which are included on four accompanying CDs. This in-depth scriptural study of God’s plan will open your eyes to why man was created—why the world is poised on the brink of disaster—and how God plans to usher in a New World of peace, abundance and happiness. God’s Plan for Mankind is intended for serious-minded Bible students with a basic knowledge of the Bible and an understanding of God’s weekly Sabbath and holy days. This book contains what the apostle Paul calls “strong meat” or “solid food”—as opposed to the “milk” of the Word. It is recommend that those who are “new in the faith” first read Occult Holidays or God’s Holy Days—Which? This book explains the basic meaning of God’s Sabbath and holy days as contrasted with the pagan “Christianized” holidays of this world. Afterwards, the meatier material contained in God’s Plan for Mankind will be easier to comprehend. Fred R. Coulter graduated from Ambassador University with a BA in Theology in 1964. His interest in Greek studies has resulted in an independent translation of the New Testament, The New Testament In Its Original Order: A Faithful Version With Commentary. He is the author of several books, including: A Harmony of the Gospels in Modern English, The Christian Passover, The Day Jesus the Christ Died and Occult Holidays or God's Holy Days--Which? Mr. Coulter continues to write and give sermons as a minister of the Christian Biblical Church of God.